Some of us are one-person people. Some of us are part of a bigger tribe. Neither one is wrong, or better than the other. Just, different. I am the type of person who has several “best friends.” These are girls I have known at least since middle school and we have managed to sustain our friendships through high school, college, and early adulthood. No one knows me better than these people. Then I have a little bit wider of a circle that I would call “close friends.” This is a diverse bunch. It includes friends from my current work, old jobs, church, and friends of friends. I am so grateful for what these people contribute to my life. Then of course, we all have an outer circle who we don’t see or talk to often, but still, we consider them a friend. When I talk about simplifying relationships, I am not talking about cutting people out of your friend circle. Instead, I’m pushing myself and you to think about the quality of these friendships – how can you invest more into them? How can you nurture and strengthen the bond? What do we let get in the way? I think we complicate relationships so unnecessarily and it’s time to DECLUTTER. Let’s take friendship back to the basics. LOVE. GRACE. TRUTH. Here is what I want for my friendships: honest communication, realistic expectations, and to always, always, always believe the best of each other. I want to be all in. And here is what I’m no longer allowing to divide me from the people I love: hurt feelings, busyness, assumptions, carelessness, idealistic expectations, deception, manipulation, passive aggressive tendencies, score-keeping, bitterness, spoken words, or unspoken words. If you’re like me, you’ve picked your friend circle carefully. At nearly 30 years old, I have moved on from any “toxic” or unhealthy relationships. Let’s be the friend we want to have. When I’m feeling hurt or left out or forgotten, all I need to remember is the TRUTH: these women love me and would never intentionally hurt me, or I them. Something that I’ve learned over recent years is that friendships flux. They are so dynamic, never standing still or static. At times you couldn’t be more in sync, and other times you just keep missing each other. 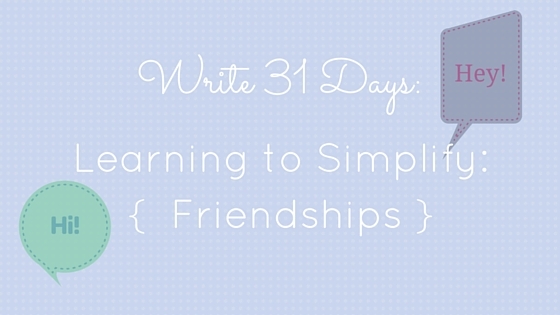 Friendships change based on seasons of life – obviously. There are times when one person can pour into it and maintain it while the other person has very little to give, like in times of significant change or hardship. This can easily strain a relationship, but it doesn’t have to. I’ve been on both sides of this, and honestly I think it takes just as much grace to be either person in that scenario. If we are the one giving, also give abundant grace and without expectation or tallying. One day, the seasons will shift and it will be you who is unable to contribute. Give yourself grace then too, because it’s only temporary and you’re doing the best you can. Let’s value these people we share our lives and our hearts with. Let’s show them how much we value them. Anything less than that causes us to miss out on all the blessings of true relationship. 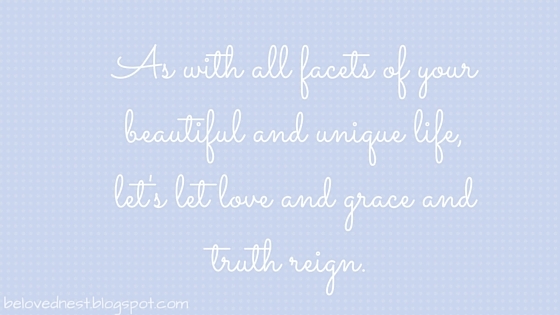 As with all facets of your beautiful and unique life, let’s let love and grace and truth reign.